A resident of Belfast is challenging the state’s decision to issue a wastewater discharge permit to a company that plans a $250 million indoor salmon farm in Bucksport. 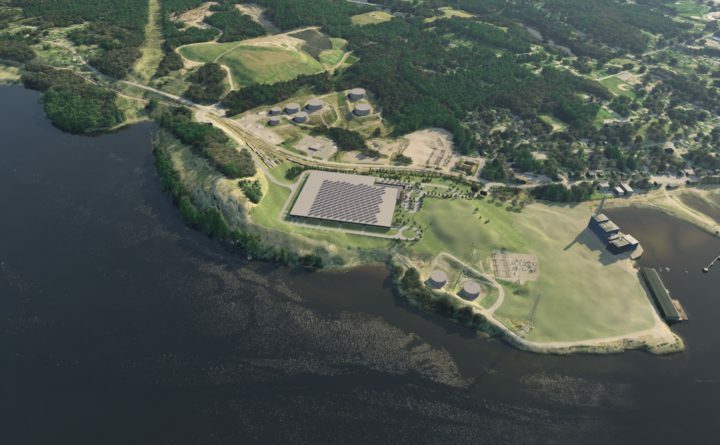 The 27-page appeal from Holly Faubel could delay salmon farm developer Whole Ocean’s purchase of property on the site of the former Verso Paper mill, where it plans to start building the aquaculture facility in the spring. The appeal continues a pattern of the loudest objections to the proposed Bucksport salmon farm coming not from Bucksport, but from the city 24 miles away where another salmon farm is proposed. In her appeal filed Dec. 17 with the state Board of Environmental Protection, Faubel argues for a number of changes to the wastewater discharge permit the Maine Department of Environmental Protection issued to Whole Oceans on Nov. 21. She wants the permit to compel Whole Oceans “to filter, sequester and remove all mercury” from the farm’s input water before it’s eventually discharged with the farm’s effluent into the Penobscot River. Faubel’s appeal is the only one challenging Whole Oceans’ wastewater discharge permit, but the company has yet to receive a number of other permits — which could also be subject to appeal — before it can begin construction. In her appeal, Faubel writes that it’s to Whole Oceans’ advantage to address the issues she’s bringing up early. Faubel says she owns 250 feet of shorefront in Belfast and that she is a former business development manager for Intel Corp. and former employee of the David Sarnoff Research Center in Princeton, New Jersey. “Likewise, it is up to the Chair and Members of BEP to help the people of Bucksport, and the Corporation who seeks to conduct business there, to address this issue promptly,” Faubel added. According to the appeal timeline set by Maine law, Whole Oceans has 15 days starting next week to provide commentary to the Board of Environmental Protection as to whether the board should review new information Faubel provides, said Cynthia Bertocci, an executive analyst with the Board of Environmental Protection. The board meets the first and third Thursdays of the month. At the earliest, Bertocci said, the board would review the appeal in late February. Appeals then can go to Superior Court if the board rejects them, Bertocci said. Richard Rotella, Bucksport’s community and economic development director, said he retained hope that Whole Oceans would close on its deal with mill site owner American Iron and Metal by early next month. The company had hoped to close if there were no appeals of its DEP permit, Rotella said. Some Belfast residents also expressed opposition to the project before the state issued Whole Oceans the wastewater permit. The only public comments the DEP received opposing the Bucksport project came from two Belfast residents and one Belfast native, according to Gregg Wood of the Maine DEP’s Bureau of Land and Water Quality. Those three comments were among eight total the DEP received about the proposed Bucksport salmon farm. Whole Oceans is a Portland-based company planning to build a $75 million land-based aquafarm to raise Atlantic salmon. When complete, phase one of the project will create 50 jobs, the company has said. Whole Oceans has said it hopes to expand its initial $75 million investment to more than $250 million in Bucksport in a phased, multi-year plan. It will initially produce 5,000 metric tons of Atlantic salmon per year. The company plans over the next 15 years to produce as many as 20,000 metric tons per year.